Size: 4.5" x 2.6" x 0.3"
The TI-305 and its solar power twin TI-306 appeared together with the credit card sized TI-307. The rare TI-308 Elle cut out the memory from the basic design. All four calculators share a similar design with a valuable "look and feel". Dismantling a TI-305 is not very exciting, we know this type of construction from dozens of far-east calculators. 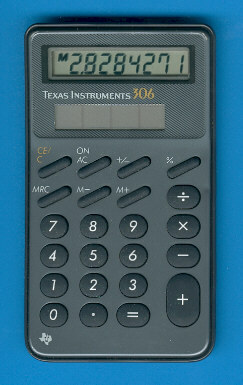 Within some month the TI-306 was slightly redesigned to accommodate smaller solar cells. Don't miss the second generation TI-306. The first prototypes of the TI-306 were manufactured in Hong Kong without any date code on the back.